One of the oldest and most respected private management companies in the NYC metro area manages 150 Bay Street. 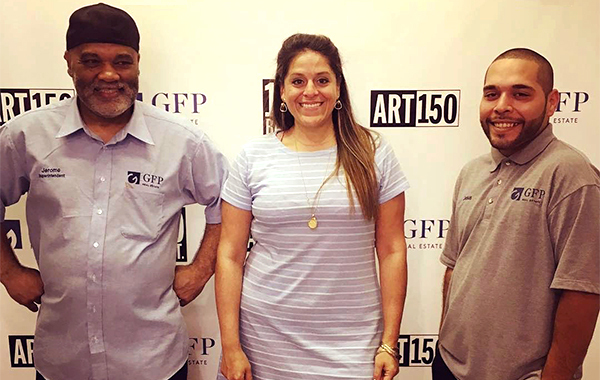 The GFP Real Estate, LLC staff is dedicated to assessing, meeting, and exceeding the needs of a lifestyle community through exceptional services and an exceptional environment. Come work, live, and create with us! Julia Camacho, Senior Managing Director and licensed Salesperson, joined GFP Real Estate in 2006. Julia has valuable experience in the development and management of real property. Ms. Camacho leases and oversees a half a million square feet, supervises the day-to-day building operations and manages over 100 office, residential and retail tenants. Ms. Camacho’s commitment to providing tenant relations, customer service and creating a unique experience at 150 Bay is unparalleled in the industry. Jerome Peay, Superintendent and licensed Fire Safety Manager, has been with GFP Real Estate 30 plus years. His exemplary work ethic is recognized and applauded by the building’s tenancy. Mr. Peay resides in the building and is a respected and seasoned asset to 150 Bay Street. Jesus Malave is the porter and a licensed Fire Safety Manager; he joined 150 Bay Street in 2016. He has shown to be an efficient and competent team player. His positive attitude and disposition make him a great addition to our team.